Versatile tropical fruits, bananas are nutritional powerhouses, rich in vitamin C, potassium and dietary fiber. Crispy, sweet and guilt-free, baked bananas chips are a cinch to make. A portable, high-energy treat, baked banana chips are just right for a hiking trip or as part of a healthy lunch. 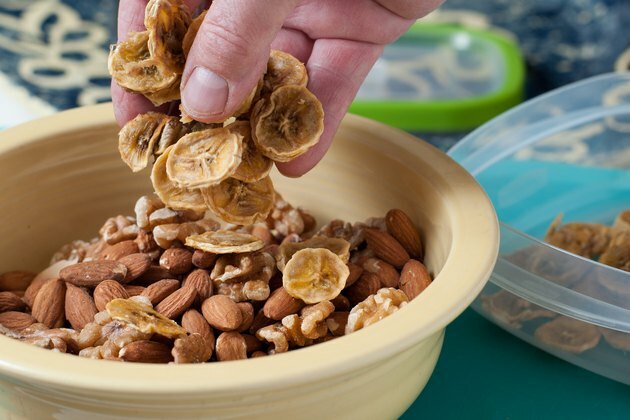 Eat the chips as is, or combine them with a variety of nuts and dried fruits for a healthy trail mix. For the best flavor, choose bananas that are ripe but firm with a few brown speckles but no bruises, soft areas or large brown spots. Cut the bananas into thin slices. For extra crispy banana chips, make the slices about 1/8 inch. Otherwise, cut the bananas into 1/4-inch slices. Depending on the thickness of the slices, two large bananas make about 60 chips. Lemon juice adds flavor and vitamin C but, more importantly, prevents the banana chips from turning brown during the baking process. For the best flavor, use freshly squeezed lemon juice. 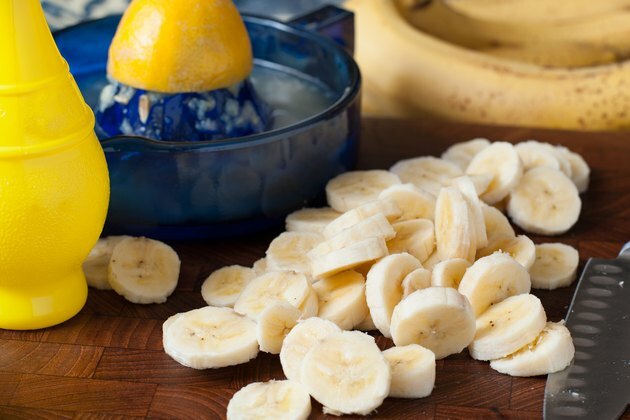 Dip the banana slices into the juice, ensuring each slice is completely covered in juice. 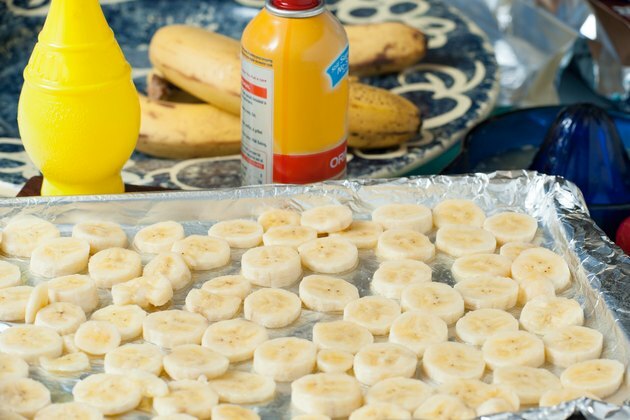 Arrange the bananas on a baking sheet coated with nonstick cooking spray. For even easier cleanup, cover the pan with aluminum foil and then spray the foil with nonstick cooking spray. 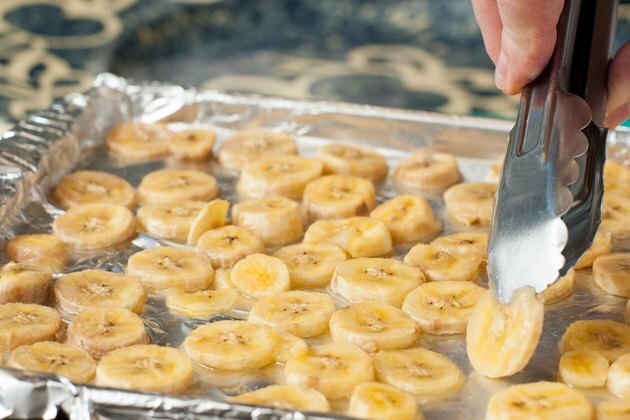 For baked bananas with a slightly different flavor and texture, sprinkle the bananas with sea salt or kosher salt. 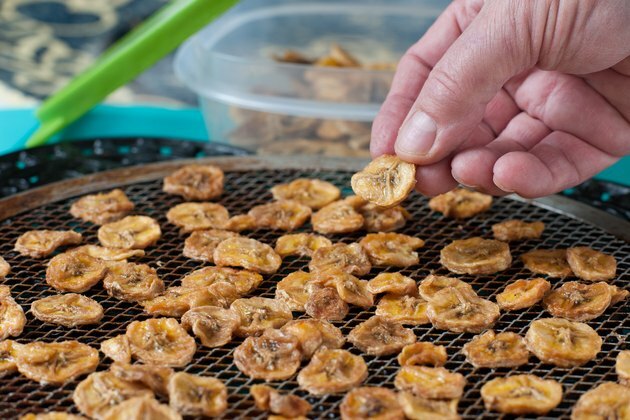 For crispy banana chips, bake the banana slices slowly in an oven preheated to about 200 degrees Fahrenheit. Too much heat scorches the bananas and may result in chips that are burned on the outside and soft on the inside. Bake the bananas for one to three hours, depending on the desired level of crispiness. To promote even baking, flip the slices halfway through the cooking time. 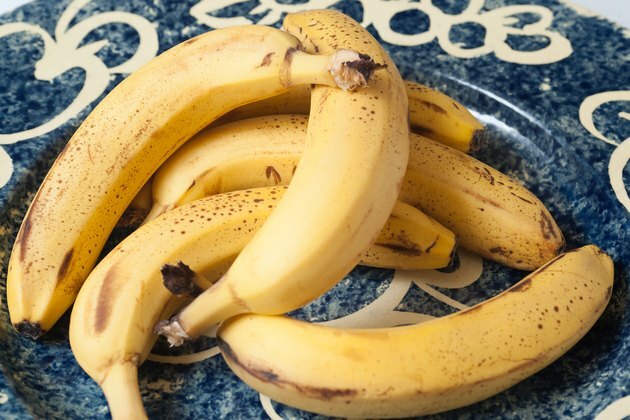 Before storing or eating baked banana chips, cool the bananas completely on a wire rack. Then store the banana chips in an airtight plastic or glass container or a resealable plastic bag.